How can one christmas gift give a healthier body, a peaceful mind, and a soothed spirit? How do you show how much you value a friendship that’s priceless? How could the present you give say “remember you are amazing,” in a way that will last? Aah Christmas - the festive season that's almost guaranteed to leave most of us feeling bulldozed on Boxing Day, knackered in the New Year, and jaded in January. Wouldn't it be wonderful to give a loved one the gift of feeling restored, renewed, and maybe even happier AND healthier? Well, I've been working with Father Christmas' elves to create exactly that. 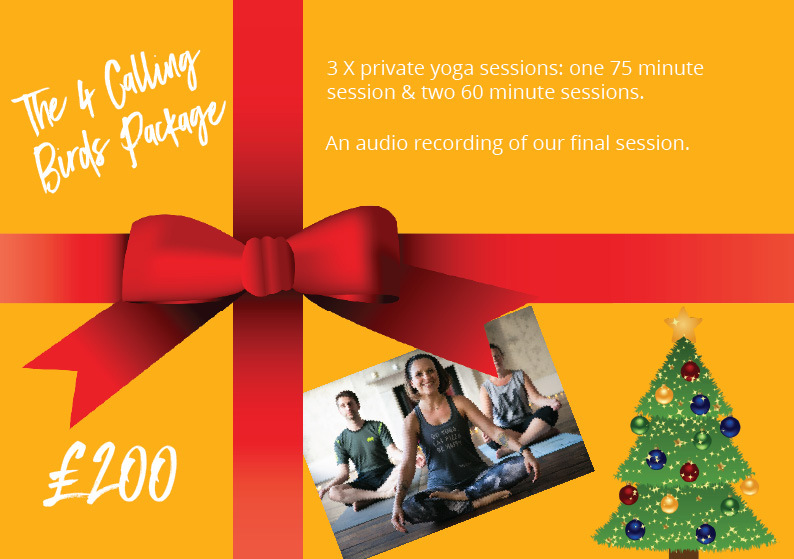 I have five perfectly formed yoga gift packages to help you show the person you love just how awesome you think they are, and how awesome you want them to feel. Complete beginners will get a wonderful introduction to yoga and a thorough grounding in the basics they need to know. Experienced yogis will be able to build on their existing practice, and delve deeper into their own areas of interest. Recuperating students (whether from a frantic festive season or illness and injury) will be supported to restore and recover. 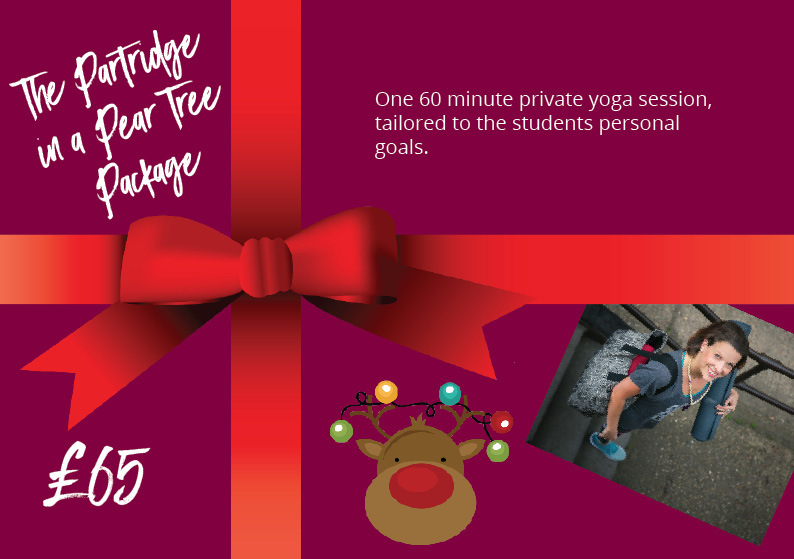 3 X private yoga sessions: one 75 minute session including goal-setting, and two 60 minute sessions tailored to the student's personal goals and requirements. An audio recording of our final session and a pdf of notes, so the benefits from our time together need never end! An audio recording of our final session so the benefits from our time together need never end! 3 X private yoga sessions: three 60 minute sessions tailored to the student's personal goals and requirements. One private yoga session of 60 minutes, tailored to the student’s personal goal and requirements. When your order has been received you’ll be sent a link to the gift certificate (as a pdf) for you to print, simple instructions for the recipient to follow for booking our session/s together, and a short health questionnaire for them to complete prior to our session/s together. If you have ordered the package that includes clothing, your order will be dispatched within one working day of receiving your order. One final thing to note – with Christmas we have to consider posting dates. If you are ordering packages one, three or four you can order any time up until 23rd December, as the gift certificate will be emailed to you. If you are ordering package one or two you can only order up until Thursday 20th December, to allow enough time for your clothing item of choice to get to you. Sessions will be delivered by me at the recipient's home in London (zones 1-4). If this isn’t possible, a private space in SE19 can be hired, but please be aware that this will require an extra payment of £15, which can be paid by the recipient or the purchaser. The sessions are only available on Fridays after 4pm, Saturdays and Sundays. All sessions must be taken within 6 months of the purchase date. After this date, certificates cannot be redeemed. All clothing items are non-returnable and certificates are non-refundable and non-transferable. If you’ve got any questions or wonderings, please don’t hesitate to email me.